General Truman Hempel "Ted" Landon was a U.S. Air Force general and commander, U.S. Air Forces in Europe. Landon was born in Maryville, Missouri, and grew up in Carlinville, Illinois. After graduation from the Carlinville High School in 1922, he attended Blackburn College in that city and, in 1924, entered the United States Military Academy at West Point, New York. He graduated from the academy in 1928 and received his pilot and observer ratings at Kelly Field, Texas, February 15, 1930. 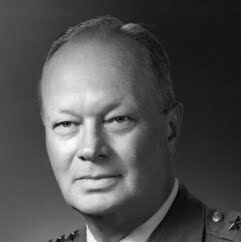 General Landon was a command pilot with more than 7,800 hours. Following two years with the 3rd Attack Group at Fort Crockett, Texas, he served as a flying instructor from 1932-1936 at Randolph Field and with the Sixth Bomb Group at France Field in the Panama Canal Zone from 1937 to 1939. The commander of the 38th Reconnaissance Squadron from 1939 to 1942, General Landon participated in the first mass flight of B-17s from Hamilton Field, California, to Hickam Field, Hawaii, May 13, 1941. On December 7, 1941 while en route to the Philippine Islands in command of the 38th Squadron, General Landon arrived at Hickam Field, Hawaii, during the Japanese attack.